Slimming and fitness sessions tend to cost about £5 a week. But the cost for our "Couch to 5k" programme is a remarkable £20.00 for the entire programme! PLUS you get a free Bonus Week. PLUS you also get a free GFF T-shirt! Are you ready to become a new you? To transform yourself from a ‘couch potato’ to the fit, healthy and energetic person you know you can be? We’re here to help you get started and to improve. 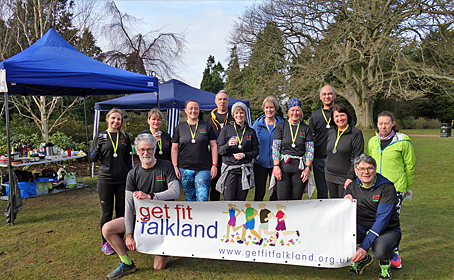 Get Fit Falkland is a group of runners of all abilities, shapes, sizes and ages. Our main challenge, though, is to get people just like you off their bums and get them active. 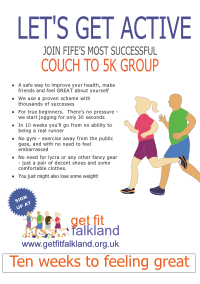 Get Fit Falkland’s Couch to 5K programme is an initiative exclusively for beginners. We’re ready to help you be the person you want to be. To believe in yourself. To get fit! All that YOU need to do is WANT to get fit, and to follow our proven programme. Fancy the idea of jogging or running but not sure if you’re up to it? If you have a medical condition that makes you wonder whether you can do out progamme, take a look at our HEALTHCHECK page. As you set out on this exciting journey, you won’t be on your own. Led by trained leaders, the group will undertake the challenge as equals, all starting together, all succeeding together. Pulling each other along. All of our volunteers have completed a Run Leader course, and possibly have other additional qualifications. That's important. But maybe even more important is that each leader knows what you’re about to go through, because they’ve been through it themselves! One thing is for certain. They’ll be taking good care of you. Every step of the way.